In the music performance major, students have many opportunities to do what they love: perform. Students are required to give at least two recitals in IC’s performance venues, allowing them to showcase their growing expertise in their instrument or voice. They participate in a wide range of ensembles, have weekly private lessons with a faculty member, and attend a weekly repertoire class where they perform and get feedback from their peers. Performance tours take students to cities such as New York and Washington, D.C., and even overseas. The summer before her senior year of college, Daniela Schmiedlechner ’14 started babysitting a three-year-old girl who had autism spectrum disorder and didn’t speak. Sometimes, if the little girl seemed restless or agitated, Schmiedlechner would sing to her, and the girl would calm down. When Schmiedlechner noticed the positive effects of her singing, the music performance major decided to do a vocal exercise where she sang vowels repeatedly to the girl. About an hour afterward, the girl looked at her and started repeating the vowels. “She started going, ‘A…E…I…,’ and it was just such a gratifying feeling,” she said, to know that music could have such a positive effect. Schmiedlechner decided to research careers that would give her this feeling all the time, which eventually led to her discovery of music therapy. Thanks to her brother, she already knew a little something about the healing power of music. Schmiedlechner grew up in Ukraine surrounded by music. Her father played the accordion and violin, and her aunt was a piano professor in Italy. Schmiedlechner began taking piano lessons as young as four years old and started vocal lessons at seven. She used to sing to her younger brother who was born with cerebral palsy, a neurological disorder that affects body movement and muscle coordination. Despite the difficulties such a disorder poses, Schmiedlechner said her brother is always “happy and determined”—and he loves music. “I would love to help other children who are like him and improve their quality of life as much as possible through music,” Schmiedlechner said. Schmiedlechner considered music schools in the United States, United Kingdom, and Austria. She heard about Ithaca through a connection in her high school, and she was intrigued by the classes and the opera workshops that were offered—in addition to the impressive voice faculty members. Once she visited campus for her audition, she was hooked. Schmiedlechner majored in music performance and minored in integrated marketing communications, which she hoped would give her a range of employment opportunities. During her junior and senior years, she was also involved in a few performances, including two operas. She described the last opera she performed in, L’étoile, as one of her favorite experiences. 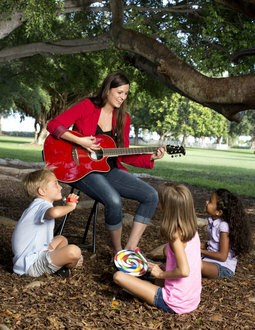 Schmiedlechner is currently a full-time student at the University of Miami studying music therapy. In the three-year music therapy master’s degree equivalency program, she is catching up on undergraduate classes that she hadn’t needed to take as a music performance major, such as psychology and neuroscience courses. Once she completes those course requirements, she will begin taking graduate-level courses required for the master’s degree. Schmiedlechner is currently doing her practicum in the orthopedic unit at Miami Children’s Hospital. She recently attended a music therapy conference where she was elected secretary of the southeastern region of the American Music Therapy Association of Students. “With all the work I’ve done in acting classes and all the performances I’ve done, I’ve definitely continued to develop my ability to empathize with other people, which I feel has helped me a lot with my current program,” she said. After completing graduate school, Schmiedlechner hopes to get a job working with children as a music therapist in a hospital. Eventually, she would like to open up a private practice, maybe go back to performing—or help to start a music therapy program at IC if the opportunity presents itself.